Every Disney aficionado knows D23 is the Official Disney Fan Club. The "D" stands for Disney and the 23 you wonder?....1923 was the year that Walt founded his company. Each year die hard Disney fans flock to the bi- annual D23 Expo at the Anaheim Convention Center. It's billed at the "ultimate Disney Fan Event" where fans connect and immerse themselves in everything Disney. This is when Disney celebrities and corporate leaders make their "big announcements" to their legions of devoted followers...and July 2017 D23 expo offered plenty of glimpses into what family vacations will look like for many years to come. Star Wars - Star Wars Land, officially named "Star Wars: Galaxy's Edge" will open at Walt Disney World Hollywood Studios Orlando in 2019. (This park expansion is also happening in Disneyland Anaheim). So far, the only "tidbit" Disney CEO Bob Iger would share is that this is a 14 acre park expansion and there will be two brand new anchor attractions. Guests will fly their own Millennium Falcon on a secret mission for the resistance. The other attraction will put guests right in the middle of an epic battle. One would speculate that this area will also be the new home of some of Disney's existing Star Wars attraction like Disney's Jedi Warrior Training and Star Tours. Star World Resort - There will also be a luxury "game changing" Star Wars immersive hotel coming to Hollywood Studios Orlando. Guests will immediately become "citizens of the galaxy" as they become part of the saga including costumes. The lobby bar will be themed after the Star Wars Cantina from Episode IV. It will be a "family friendly" version complete with droids and far less scum and villainy. From the artist rendering pictured here, it looks like Disney may be "re-purposing some of their "virtual window" technology from their Disney Cruise ships. This is where guests without windows staying in inside cabins are treated to a "virtual" live balcony, complete with surprise visits from Disney characters. The guess here is that your virtual view will be that of deep space. Disney's Rivera Resort - As Disney was opening it's doors to the new Copper Creek Cabins over at the Wilderness lodge, they were announcing the opening of their 15th Disney Vacation Club Property, Disney's Riviera Resort. Yes, Disney Vacation Club is the membership (timeshare) side of business. Rooms here become available to vacation club members first for a limited time before they go on sale to the general public. This 300 unit high rise resort offers luxury accommodations to it's guests and is expected to open in 2019. It is located adjacent to the current Caribbean Beach resort area and will supposedly offer a roof restaurant with spectacular views of both Epcot and Hollywood Studios nighttime spectaculars. Diney Skyliner - Part of this 2019 construction project for Disney's Rivera Resort also includes a hub for a MAJOR transportation expansion coming to the parks - meet Disney Skyliner. The new Skyliner will be 8 passenger ski lift style gondolas that will ease transportation for all park visitors traveling between EPCOT, Hollywood Studios and the Art of Animation, Disney Riviera and Pop Century Disney Resorts. These gondolas offer a bird's eye view of the parks. Not only do their feature many of Disney's beloved characters they are also handicap accessible. Minnie Vans - The popularity of Uber & Lyft has not gone unnoticed by Disney for fast private transportation in and around the parks. Disney's solution - Minnie (mini) vans. This service starts August 2017. These are 6 passenger mini vans complete with 2 children's car seats chauffeur driven by Disney castmember (aka employees). They are easy to spot tricked out in red and white polka dots that Minnie herself would love. You can order your own private Minnie Van right from your phone at a cost of $20 per ride. This is a bit more expensive compared to Uber or Lyft. The difference is Minnie Vans are allowed to pick up guests right from park entrances verses Uber & Lyft which can only access the main ticket and transportation area. Leaving the park after a long park day with exhausted kids?...this $20 could be money very well spent. EPCOT - The universe of energy attraction close August 2017 and will be transformed into a roller coaster style attraction for Marvel's Guardians of the Galaxy – Mission: BREAKOUT! Also expect to see a 4D attraction of Ratatouille added to the France Pavilion area. Guests will be able to shrink to Remy’s size and scurry to safety in a dazzling chase across a kitchen with the sights, sounds and smells of Gusteau’s legendary Parisian restaurant. Hollywood Studios: Mickey and Minnie’s Runaway Railway will soon will put you inside the wacky and unpredictable world of a Mickey Mouse Cartoon Short where you’re the star and anything can happen. This zany out-of-control adventure features surprising twists and turns, dazzling visual effects and mind-boggling transformations that happen before your very eyes. All this and a new singable song to go along. The Great Movie Ride at the Chinese Theater will be closing to make way for this extravaganza. Magic Kingdom - A new Tron themed attraction will be built near space mountain along with a new Live -entertainment theater to be built along Main Street USA. PS...Disney Cruise Line - Will be growing their fleet from 4 ships to 7. It was announced that Disney has ordered 3 new ships to be delivered in 2021, 2022 and 2023. Details are still very secretive by these ships will be larger although carry about the same number of passengers. Disney is a premier cruise line known for it's innovations at sea. Although these dates may seem like an eternity away, remember most cruise lines post schedules and prices about 1.5 to 2 years in advance. Disney differs from other cruise lines in the fact that Disney families and fans like to "collect" ship experiences. In many cases holiday and spring break sailings sell out in a matter of hours. Be sure to plan ahead and make your Disney cruise reservations early. 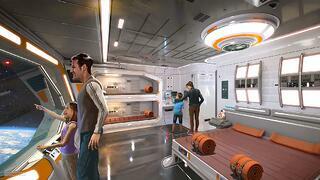 Stay tuned to Vacationkids for announcements when the new Disney Star Wars and Riviera Resorts go on sale. With Disney, we ALWAYS recommend you make your vacation plans 1- 1.5 years in advance to get the resort room and package of your choice. Planning ahead also allows you to take advantage of our free "Vacation Layaway" which makes your Disney Vacation more affordable. Always book your Disney Vacation with an experienced Disney Travel agent. It doesn't cost you any more than if you did all the planning work yourself. Instead you get a world of full of tips, knowledge and personal experience that will make your family's vacation even more enjoyable.